Available in the UK from Aerco at highly competitive prices and low MOQs, Hypertac HBB connectors are rated up to 750A and provide easy mating and quick release with over 2,000 mating cycles. This combination of high current capability with small size and high levels of environmental performance makes the HBB range particularly suitable for electric drives used in fighting vehicles, weapons, avionics, rail transport and automotive and medical equipment. 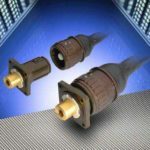 Using the well-proven Hypertac hyperboloid contact technology, the standard connectors are rated at 300A and 500A while versions capable of over 750A are available on request. 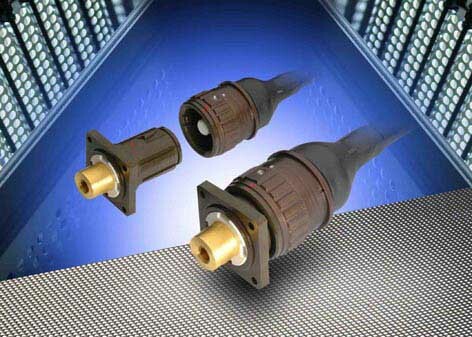 These single-pole circular connectors are supplied in a choice of metal or high-strength composite shells, are sealed to IP67 and provide 360° EMI/RFI shielding. Configurations are available in cable or panel mount versions with straight or right angle backshells. Rated up to 1000V DC, the HBB series can accept cable sizes of up to 70mm² for 300A versions and 120mm² for 500A versions. Receptacles are available with sizes conforming to MIL-DTL-5015, while metal versions offer a variety of plating options including zinc/cobalt, cadmium, electroless nickel and RoHS compliant zinc-nickel.